(CNS): Despite the trials and tribulations of Portsmouth Football Club its new mascot ‘Pompey’ the blue iguana can sleep easy as the DoT says it has been assured by the club’s commercial director that they are still backing their new lizard friend all the way. The ongoing financial troubles of the club reached a new high recently when HM Revenue & Customs (HMRC) applied for a winding up petition against the struggling premier league side. The club’s sponsorship of one of Cayman’s own ‘blues’ came about following a visit to the islands by the club’s director of operations, Lucius Peart. Having visited the blue iguana recovery programme Peart was completely taken by ‘Pompey’ who although no good at football is one of only a handful of Blue Iguana’s that had survived in the wild. 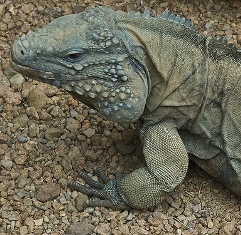 Rescued from the side of road and almost certain death she is now living at the blue iguana recovery programme at the botanic park where she is adding her diverse genes to boost the limited pool of the breeding programme. The sponsorship which was welcomed by the National Trust which runs the programme is not atrisk even though the football club is struggling to strengthen its financial position by then and threatened with bankruptcy. “Pompey” is to feature on a collection of merchandise which will still be going on sale to the clubs fans in the UK. Portsmouth has disputed the amount of money HMRC says it owes and was expecting the demands to be withdrawn according to reports on the BBC. If it does not, the club said it anticipates, "a hearing being held in early January 2010 during which we will request that the High Court order HMRC to withdraw their demands.” It added the VAT, PAYE and National Insurance contributions owed to HMRC had been paid, were about to paid, or were being disputed. Portsmouth currently lies at the bottom of the Premier League and has recently appointed ex-Chelsea manager Avram Grant to try to revive its fortunes on the pitch. The club has been the subject of takeover bids and speculation since the summer. Dubai businessman Suleiman al-Fahim bought the club in August, having initially agreed a deal in May. But after questions were raised about Mr al-Fahim’s finances, he then sold on a 90% stake in the club to Saudi property tycoon Ali al-Faraj. Despite promises of significant investment from its new owner, the club remains in financial difficulties. It has even been banned from buying any new players until it pays off debts owed to other English clubs. Under manager Harry Redknapp, Portsmouth won the FA Cup in 2008. However, since Redknapp left for Tottenham Hotspur, the club’s fortunes have been in decline. It has sold many of its cup-winning team, some of which have moved to Spurs to rejoin Redknapp. (CNS): Focus and coordination are the new goals at the Ministry of Community Affairs and Housing says the minister Mike Adam as he aims to empower communities in the Cayman Islands. Poverty reduction; improving parenting skills; stemming negative societal trends such as drug abuse, and streamlining services to assist children in need of care and protection, while addressing youngsters’ behavioural issues as well as housing needs are the areas where he says his ministry will be focused and co-ordinating efforts across all the relevant agencies. The new ministry of which Adam is at the helm now focuses all of the country’s social services and support networks ’s under one government ministry providing the opportunity for the minister to bring together the various agencies and have them focus on the same goals of helping and empowering those who need support. Speaking to CNS before Christmas, Adam said that over the years there had been many studies and research projects, assessments and reports on the needs of the more vulnerable in the community and it was now time to bring all of the expertise, knowledge and experience together and to focus on what needed to be done to make changes. He said that the National Assessment of Living Conditions (NALC) the most recent and comprehensive study of poverty in Cayman would also form part of the new vision and strategy for his ministry. Conducted during the previous administration, Adam said however, that the information in it would be informing policy for the future. He said his primary goal was to ensure that the services delivered to the people who needed them were focused, streamlined and targeted. Adam said in the past there have been duplicated efforts and some misdirection of resources that needed to be addressed. Adam’s Ministry includes the Department of Children and Family Services; the Department of Counselling Services; the Children and Youth Services (CAYS) Foundation (the Frances Bodden and Bonaventure homes), and the National Housing Development Trust. One of the minister’s primary aims is to strengthen team work and collaboration among the related agencies. Adams said that each agency needed to have a common goal and vision and the ministry was seeking to lay the foundation for that framework and the collaboration needed to achieve goals. The policy outlines how the department staff will inform clients about the complaints handling procedures; how they will acknowledge the complaints and suggestions that are made; and the standards to be applied in responding to them. Among the stipulations are that reports made should be acknowledged within three working days, and responses provided within 14 calendar days after receipt, the DCFS Director explained and added that Complaints Commissioner Nicola Williams, had given the measures her endorsement. “It is the responsibility of all staff to respond to customer issues in a courteous manner, and to provide complainants with information on the DCFS complaints handling system,” she said. For further information and to download the official complaints form visit www.gov.ky or the DCFS office, Britcay Building, Eastern Avenue. (CNS): Having barely recovered from the bruising 3rd test of the Challenge Cup, the members of the Cayman Rugby Union joined together to celebrate the festive season with their annual Boxing Day “President’s vs. Captains” match on Saturday 26 December at the Rugby Club. A release from the CRU says the Boxing Day game, played in Cayman since the Cayman Rugby Union’s inception, has been an opportunity for players of all ages and abilities to get a social run around and enjoy the lighter side of the sport of rugby, namely the camaraderie (whilst still keeping some semblance of competitiveness at the back of their minds). With the Cayman Rugby Union providing complementary champagne and a full Xmas buffet it was a wonder why the players did not forgo sweating it out under the lovely Cayman sunshine to enjoy the food and booze but tradition won over and the game went ahead. With both sides looking evenly matched it appeared as though the familial teaming of Coach Steve Clark and sons Josh and Joel for the Captains’ XV had tipped the balance in favour of the Captains’ side. 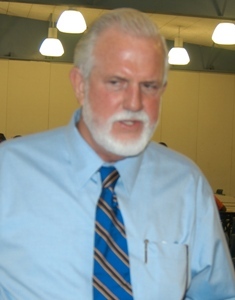 Coach Clark, playing in his one game of the year is usually seen focussing his rugby energies on the sidelines of the pitch when overseeing the Cayman National U19’s team but he didn’t miss a step during the 80 minutes of Rugby on Boxing Day still managing to cut his way through younger opposition. The Captains XV managed to maintain a lead throughout the game until the arrival of the fearsome Fijians lead to some spectacular solo efforts for the Presidents XV to bring the game to a close finish. Not to be outdone by the Fijian superstars, the CRFU President Derek Haines ran in a 30 Yard effort from the base of the scrum cheered on by the crowd to score the final try of the game to a 25-17 win for the Captain’s XV. Since 2004, a seasonal fishing ban has been in effect in all designated Nassau grouper (Epinephelus striatus) spawning areas in the Cayman Islands and research has been underway to learn more about these important fish under the Grouper Moon Project. Closed circuit re-breathers (CCR) allow divers to stay down longer at greater depths because unlike regular Scuba gear it delivers a constant partial pressure of oxygen. “Having watched Dr. Brice Semmens’ fascinating presentation several times, we recognized the value of the data being collected for the sustainability of the groupers for future generations. And so we contacted several of our partners and suppliers and were successful in getting some expensive equipment as a donation to the project,” Easterbrook said. Silent Diving donated an Inspiration Classic CCR and Shearwater Research donated a Pursuit trimix computer. Local companies PM Gas donated oxygen tanks, and Divetech donated the training and materials for DOE Research Officer James Gibb to become a certified CCR diver. Bruce and Lynn Partridge from Shearwater Research Inc. said they were pleased to offer support to the DoE and the Grouper Moon Project (REEF). “We applaud the efforts of those involved with the catch, tag and release of Cayman’s endangered groupers. As divers, we all appreciate a healthy fish population. The success of this program will also contribute greatly towards a establishing a sustainable fishery in the area." Silent Diving is the distributor of the Inspiration and Evolution rebreathers. The re-breathers are well tested both in the field and through extensive CE testing in the UK before release. “As divers, the Grouper Moon Project made sense to us, as it is paramount to manage our marine fisheries in a responsible manner, and this takes knowledge. It was an easy decision to support this worthwhile project as we are also frequent visitors to Cayman,” said Mike Fowler of Silent Diving. The project began in Little Cayman in 2002 as an effort to prevent the imminent collapse of what was thought to be the Cayman Islands’ remaining viable spawning aggregation of Nassau grouper (located at the west end of Little Cayman). The programme has since been expanded to include Cayman Brac and Grand Cayman. The Grouper Moon Project is an ongoing collaborative research programme run by the Reef Environmental and Education Foundation and the DoE. For more information visit www.REEF.org. (CNS): The Association of Chartered Certified Accountants (ACCA) has granted “Exemption Accreditation” to the International College of the Cayman Islands (ICCI) which means students study business and accounts at the school will need to do less ACCA exams in order to gain the sought after professional qualification. Graduates of the ICCI Bachelor of Science in Business Administration degree with accounting concentration will be eligible for a total of five exemptions from the required ACCA papers. The college said that the exempted papers include F1 – Accountant in Business; F2 – Management Accounting; F3 – Financial Accounting and F4 Corporate and Business Law. Graduates who complete Cost Accounting and Managerial Accounting will be exempted from F5 – Performance Management. Bachelor degree holders are exempted from all papers for the Certified Accounting Technician designation. Other Bachelor and Master degrees also receive varying exemptions depending on the degree. Graduates with Associate degrees also receive some exemptions depending upon the degree earned. ICCI’s Academic Dean, Scott Cummings and ICCI’s Director of Admissions, Hank Bodden they had been working on getting this exemption for the school for several months. “This additional accreditation of our business programs is further recognition of the quality of our faculty and the value of an ICCI degree,” said Cummings. Bodden explained that the accreditation would simplify and shorten the process for graduates. Ordinarily someone seeking ACCA’s professional designation is required to write fourteen examination papers. The exemption accreditation means ICCI graduates are exempted from writing some of the papers and helps them earn the designation in less time. Pat Marcelle-Irish from ACCA said the accreditation was a great achievement for ICCI and graduates will receive a level of exemption which matches the knowledge and skills gained from their previous qualifications. ICCI’s students will benefit from knowing which module choices will lead to maximum exemption from ACCA’s examinations, and will be assured of receiving the appropriate level of exemption immediately upon registration with ACCA. This will also mean that ICCI will be able to attract more students who wish to pursue a professional accountancy qualification on completion of their academic studies by providing them with an accelerated route to ACCA membership. 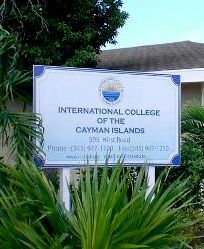 The ICCI is Cayman’s oldest college and has been accredited as a senior college continuously since 1979 by ACICS, the Accrediting Council for Independent College and schools in Washington, D.C. ICCI is also recognized by the Cayman Islands Education Council which gives credence to its degree’s and is registered with the University Council of Jamaica. The International College of the Cayman Islands is a non-profit institution founded in 1970 by the late Dr. John Hugh Cummings and continues to provide quality education under the direction of its current President Dr. John Hugh Cummings II. You can visit ICCI’s website at www.icci.edu.ky. The Association of Chartered Certified Accountants is a global body of professional accountants. ACCA has 131,500 members and 362,000 students worldwide. You can learn more about ACCA by visiting their website: http://www.accaglobal.com/. (The Water is Open): Among an extraordinarily impressive field of outstanding open water swimming heroes, the San Francisco Bay swim of Andrew Smilley from the Cayman Islands just barely out-voted the world record setting relay team of Camlough, Ireland as the 2009 Greatest Open Water Swim of the Year. Out of 9,133 votes cast by fans around the globe, 2,086 individuals voted for Andrew and 2,003 voted for the Camlough team. Andrew placed 107th in a field of 800 swimmers in the RCP Tiburon Mile where the Special Olympian from Cayman Islands also placed third in the 19-29 age in the non-wetsuit division in the San Francisco Bay in his first ever cold-water experience. (CNS): Time is running out for small local contractors that want to get in on the chance to be involved in the building of the next phase of the government’s affordable housing project. Although the initiative which has caused controversy in the past, the current minister with responsibility for housing is taking a new approach and instead of seeking one large contractor is aiming to engage a number of smaller local firms. The deadline for anyone who wishes to be placed on the prequalified list needs to contact the NHDT before Friday 8 January. 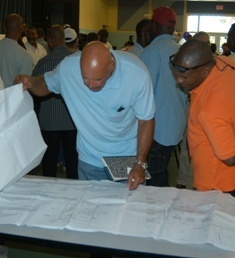 At a recent open house meeting hosted by the Ministry of Community Affairs and Housing and the National Housing Development Trust ( NHDT) Mike Adam explained that prequalification means that a contractor may participate in the public tender for contracts under the project. A significant number of local contractors from the construction industry turned up to the meeting to hear about the plans for the project and the opportunities on offer. Adam explained that the meeting was to help guide licensed small contractors through theprequalification process for providing construction services in the next phase of the NHDT’s Affordable Housing Project. According tot he ministry the project is scheduled to begin in January 2010, the plans under this new project phase are to build 12 homes in East End and 20 more in West Bay. “We felt it timely to begin dialogue with our partners on the critical issue of shelter for our people. We also need to lay the groundwork to forge new partnerships for providing that shelter,” Adam stated. He said reaching out to small contractors was a signal of the government’s intention to take a fresh approach to awarding contracts locally. “Instead of awarding a single contract to one large entity to provide construction service as in the past, this time we will include more small players,” the Minister explained. This approach Adam said, was the ministry’s way of supporting some of the small businesses that contribute significantly to the country’s economy. As well as providing low cost housing to Caymanians, the government is hoping the project will give a boost to the local economy and provide work for the rising level of unemployed local construction workers. Contractors will also be expected to source raw materials locally assisting the retail sector as well and NHDT Chairman Stephen McLaughlin said that the NHDT will stress the need to hire Caymanian workers. McLaughlin explained that the contracts would be directly between the NHDT and the general contractor who would in turn establish separate relationships with sub-contractors which would need to be licensed. According to Government information services contractors interested in pre-qualifying for the next phase of the NHDT Affordable Housing Development need to meet a number of standards and hold a certain level of experiences. Contractors should have a history in general construction, particularly demonstrable experience in constructing single family and multi-residence dwellings. They will need to have experienced personnel—including owners, construction manager and/or foreman, a valid Trade and Business License and employee pension and benefits in place.
. The government said contractors should have a proper mailing address, telephone number, fax number and e-mail as well as suitable bank references (demonstrating a $15,000 line of credit), suitable proof of insurance (contractor’s all risk, public liability and employer’s liability) of at least $250,000 and workmen’s compensation. (CNS): After tallying up their passenger number drivers have reported that around 2000 people used the YUDP sponsored purple ribbon buses on New Year’s Eve this year. The initial count comes from the bus driver’s of Reid’s Premier Tours who operated the five buses on the programme. The bus driver’s reported managing heavy crowds as the public took advantage of the free service and chose not to drink and drive. The buses were not expected to run this year but the young would-be politicians stepped in to save the programme at the last minute. Having seen reports that the National Drug Council would not be able to offer the service this year because of lack of funds, Matthew Leslie, the YUDP’ fundraising chairman rallied his political troops. With Sponsorship from the YUDP, contributions from UDP MLA’s and committees and signs donated by Sign Solutions, the National Drug Counsel was able to re-launch the programme. After the initiative to save this year’s Purple Ribbon Bus Programme, the YUDP plan to further discussions with the NDC as to their future involvement with the Programme. The Young United Democratic Party (YUDP) is the official youth arm of the United Democratic Party. In other words, for the last part of the financial year tax payers will be paying twice. The office said that in the next financial year (2010/2011), which will automatically carry a full year of revenue from the import duties introduced in January 2010, the garbage fees will be dropped. 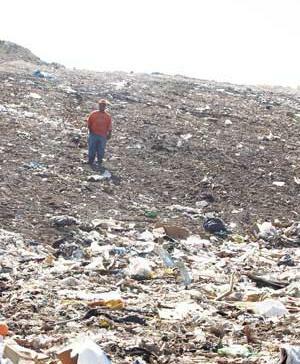 “Effective 1July 2010 onwards, government intends to cease the usual six-monthly garbage fee billing and the collection from it,” officials added. The office warned that if individuals or businesses remain in arrears for garbage fees which relate to current or prior period billings, they will still be responsible for ensuring that these outstanding fees are paid and these customers will continue to receive requests for the payment of outstanding amounts. In the past garbage fees have been billed to residences and businesses every six months – in January and June each year. Each residential billing is $50 per six months for garbage collection and business rates vary according to the type and size of the business. The FS’s office pointed out that the rates have remained unchanged since the 1990s. Moreover, the office stated that they are insufficient to cover the cost of garbage collection and not all those receiving garbage collection are paying towards the service. The government hopes that as a result of the increase in revenue it hopes to gain from duty increases it will eventually cover the historic loss of revenue in connection with garbage collection.